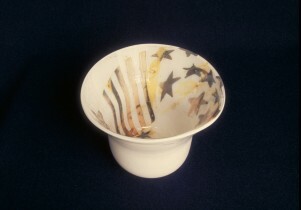 Clear glass plate cased with opal white glass, decorated with orange and brown stars and spots on the inside. Free blown clear glass with yellow orange and brown decoration cased with opal white glass. 20% lead glass. Cold glass sandblasted decoration, heated, marvered and cased. A Plate of Stars and Spots, Dillon Clarke, 1976, Crafts Council Collection: G6. This piece is one of a series. A culmination of several techniques used previously. Having used sandblasting extensively purely as surface decoration it became apparent to me to use this type of decoration while working glass hot after a seminar by the Decorative Art Society which discussed the Graal technique used in the 1900s in Sweden and France. This was a lengthy process involving a parison (not blown out piece), removing from iron and cooling and then, when cold working on the surface with acid, removing areas; reheating, returning to iron, continuing blowing process. I felt by working on pieces of cold glass thenheating them up and marvering the resulting decoration into the parison, and then casing it, I could get a somewhat similarlyclearly defined pattern. to me this was quite a new development as previously working with hot molten glass decorative qualities are somewhat soft in quality and amorphous. I can now achieve clearly defined images yet ones which are integral to the blown form.